I’m not the most nationalistic Singaporean you’d find around, but one thing I AM very proud of is the Chicken Rice. First concocted by the Hainanese who migrated to Singapore “back in the day”, this has become a national treasure, and one of our most famous exports. Most countries in the South East Asian region now have their own versions of Chicken Rice, with our closest neighbour (and fellow foodie community) Malaysia having the most variety! And when it comes to food, more variety = more deliciousness. Always. One such variation are Chicken Rice Balls. You’d think it’s just a case of rolling the rice up into balls, but you’d be wrong. There are so many things to consider: to sauce or not to sauce, chicken in or on the side…and at Rasa Delights in Eastwood, it’s whether to deep fry it. Yep, when you think that Chicken Rice can’t get any more decadent, you can always roll it into a ball, crumb it in panko and deep fry the sucker. Here, it’s pre-sauced and mixed with bits of chicken, crumbed with panko (a Japanese breadcrumb made with white milk bread) and served with Japanese mayo on the side. Kinda like if a Japanese person decided to attempt a Singaporean classic I guess. Not quite the pay off we were hoping for, but points for trying. Of course, just as a measure of quality, we also ordered the Chicken Laksa. Strips of poached chicken sits atop noodles in a shrimp/chilli/coconut broth. While it hit most of the flavour notes, this particular bowl unfortunately wasn’t thick enough for my taste. 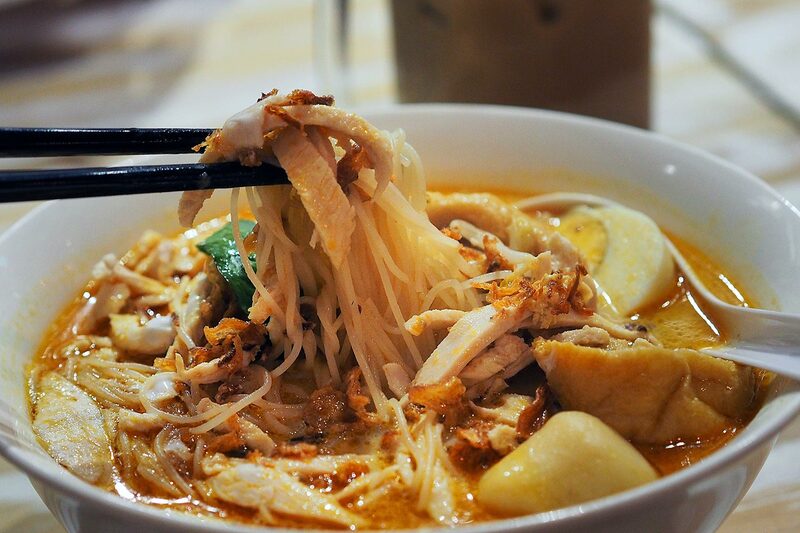 Good laksa, to me, is meant to be gao – a Hokkien term for a thickness or richness that you look for in things like Laksa, or, you know, milk teas. I was severely lacking the shrimp and eschallot mince that is meant to make up most of the soup, much like how assam laksa has flakes of sardine all through it. Not bad for a laksa in Australia, but not quite the laksa my mother has spoilt me with growing up. So back to the chicken rice it is. I must say that this hits most of the marks for me – silky chicken, glossy rice cooked with chicken fat – BUT I have an issue with the sauces. And to a South East Asian the condiments are half the battle. There have been long, snaking queues in Singapore just for good chilli alone. Well, there’s been long snaking queues in Singapore for not very much, but you know what I mean. The chilli lacked body, and the ginger sauce was weak. AND WHERE IS MY SOY DRIZZLE. True chicken rice, to me, has to be completed with a soy drizzle that is made of soy, chinese rice wine, and chicken stock that is made from cooking the chicken. Keeps the chicken thoroughly seasoned and keeps the rice juicy. And we like it juicy. Service wise, they were polite and very accommodating, and they checked in on us often enough without hovering. So that was nice. I’m still a bit pouty about the lack of condiments, but not a bad option to satisfy cravings for Malaysian food if you happen to be in Eastwood.